“Again, Christ had truths to present which the people were unprepared to accept, or even to understand. For this reason also He taught them in parables. By connecting His teaching with the scenes of life, experience, or nature, He secured their attention and impressed their hearts. Afterward, as they looked upon the objects that illustrated His lessons, they recalled the words of the divine Teacher. To minds that were open to the Holy Spirit, the significance of the Saviour’s teaching unfolded more and more. THE LORD’S ANSWERTO THE INQUIRER OF GODTEXT OF ADDRESS BY V.T. HOUTEFF,MINISTER OF DAVIDIAN 7TH-DAY ADVENTISTSSABBATH, AUGUST 9, 1947MT. CARMEL CHAPELWACO, TEXAS Our subject is found in Ezekiel twenty. This chapter, we will find, contains a prophetic history of the Church from the time of her servitude in Egypt to the time of the sealing of the 144,000. Ezek. 20:1-8 — “And it came to pass in the seventh year, in the fifth month, the tenth day of the month, that certain of the elders of Israel came to enquire of the Lord, and sat before me. Then came the word of the Lord unto me, saying, Son of man, speak unto the elders of Israel, and say unto them, Thus saith the Lord God; Are ye come to enquire of Me? As I live, saith the Lord God, I will not be enquired of by you. We have now read the record of the Hebrew host, — of their spiritual standing in the land of Egypt, and of God’s reason for bringing them out of Egypt. Next we shall read the record which they made in the wilderness. Ezek. 20:14-28 — “But I wrought for My name’s sake, that It should not be polluted before the heathen, in whose sight I brought them out. Yet also I lifted up My hand unto them in the wilderness, that I would not bring them into the land which I had given them, flowing with milk and honey, which is the glory of all lands; because they despised My judgments, and walked not in My statutes, but polluted My Sabbaths: for their heart went after their idols. Nevertheless Mine eye spared them from destroying them, neither did I make an end of them in the wilderness. But I said unto their children in the wilderness, Walk ye not in the statutes of your fathers, neither observe their judgments, nor defile yourselves with their idols: I am the Lord your God; walk in My statutes, and keep My judgments, and do them; and hallow My Sabbaths; and they shall be a sign between Me and you, that ye may know that I am the Lord your God. Notwithstanding the children rebelled against Me: they walked not in My statutes, neither kpt My judgments to do them, which if a man do, he shall even live in them; they polluted My Sabbaths: then I said, I would pour out My fury upon them, to accomplish My anger against them in the wilderness. Nevertheless I withdrew Mine hand, and wrought for My name’s sake, that It should not be polluted in the sight of the heathen, in whose sight I brought them forth. I lifted up Mine hand unto them also in the wilderness, that I would scatter them among the heathen, and disperse them through the countries; because they had not executed My judgments; but had despised My statutes, and had polluted My Sabbaths, and their eyes were after their fathers’ idols. Wherefore I gave them also statutes that were not good, and judgments whereby they should not live; and I polluted them in their own gifts, in that they caused to pass through the fire all that openeth the womb, that I might make them desolate, to the end that they might know that I am the Lord. On one hand we see the reasons for elevating the Hebrew host from Pharaoh’s slaves to God’s priests, prophets, and kings. On the other hand we see their scattering throughout all the nations. Next we behold God’s promises of their gathering out of the countries in which they are scattered. This He promises to do with a mighty hand, and with a stretched out arm. “And concerning the tithe of the herd, or of the flock, even of whatsoever passeth under the rod, the tenth shall be holy unto the Lord.” Lev. 27:32. To determine the Lord’s part, the tithe, the Lord’s lambs, goats, or sheep, were made to pass under the rod. Each tenth then was taken and set aside for the Lord. The statement of Ezekiel twenty, verse thirty-seven, “to pass under the rod,” therefore, means to separate His very elect from among the multitude, from among the “tares,” (Matt. 13:30) or from among the “bad fish” (Matt. 13:47, 48). And being thus separated, they are counted. So it is that the 144,000 (Rev. 7:3-8; 14:1) are a separate and numbered company. When God causes His people to thus pass under the rod, He will then bring them into the bond of “the covenant which He made with Abraham, and of His oath unto Isaac; and hath confirmed the same to Jacob for a law, and to Israel for an everlasting covenant, saying, Unto thee will I give the land of Canaan, the lot of your inheritance.” 1 Chron. 16:16-18. Here we are plainly told that only the elect will He bring “into the bond of the covenant.” Them only will He bring into the land of Israel. The sinners (tares, bad fish or goats) that are now among God’s people shall be taken out and be no more. “Again, the Kingdom of Heaven is like unto a net, saith the Lord, “that was cast into the sea, and gathered of every kind: which, when it was full, they drew to shore, and sat down, and gathered the good into vessels, but cast the bad away. So shall it be at the end of the world: the angels shall come forth, and sever the wicked from among the just, and shall cast them into the furnace of fire: there shall be wailing and gnashing of teeth.” Matt. 13:47-50. The separation, the Judgment for the Living, you note, brings the end of the world. God has now made clear His “clean work” which He is to do, both for the penitent and for the impenitent. It is now up to them to decide whether to serve Him or to serve their idols — they are now not making their decision ignorantly. If they wish to perish they may continue to serve their idols. These things God does for His people, not because they are deserving, but for His name’s sake, because His promise cannot fail. The Kingdom of God, you see, does not begin in heaven, but on earth. And the Kingdom, you now see, is not to be made up of ghosts, but of living human beings, of saints, not a sinner among them. In these chapters are brought to view both the house of Israel and the house of Judah. In this verse God plainly declares that He was to make three overturnings, and that after that the Kingdom was to be no more until “He comes Whose right it is”; that is, after the three overturnings, He “Whose right it is” shall come and the Kingdom shall be restored. 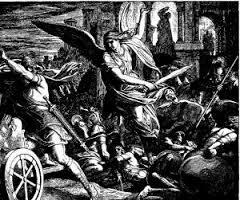 The first overturning took place when Assyria overturned the house of Israel, the ten-tribe kingdom; the second overturning took place when the king of Babylon overturned the house of Judah, the two-tribe kingdom; and the third overturning took place when Titus in 70 A.D. destroyed Jerusalem. Thus it is seen that we are now living in the period after the third overturning, the period in which “He Whose right it is,” is to come and set up His Kingdom. This, Brother, Sister, is the Lord’s Own answer to you. Your duty is now to accept it if you wish life forevermore. Let not the enemy of Truth bring doubts to your mind, and let no one talk you out of this Truth for the Devil will not stand idly by. He will do all to overthrow you. Check up again and again and see that the Bible teaches this Truth so that you be able to hold your own. You cannot afford to lose out this late in the day. ——0-0-0–0–0-0-0—— “The Lord abhors indifference and disloyalty in a time of crisis in His work. The whole universe is watching with inexpressible interest the closing scenes of the great controversy between good and evil. The people of God are nearing the borders of the eternal world; what can be of more importance to them than that they be loyal to the God of heaven? All through the ages, God has had moral heroes; and He has them now, — those who, like Joseph and Elijah and Daniel, are not ashamed to acknowledge themselves His peculiar people. His special blessing accompanies the labors of men of action; men who will not be swerved from the right line of duty, but who with divine energy will inquire, ‘Who is on the Lord’s side?’ men who will not stop merely with the inquiry, but who will demand that those who choose to identify themselves with the people of God shall step forward and reveal unmistakably their allegiance to the King of kings and Lord of lords. In Revelation 8:1, as seen above, there is silence in all of heaven. No one speaks, no songs or any noise, just silence. Something big is happening that requires no one speak. 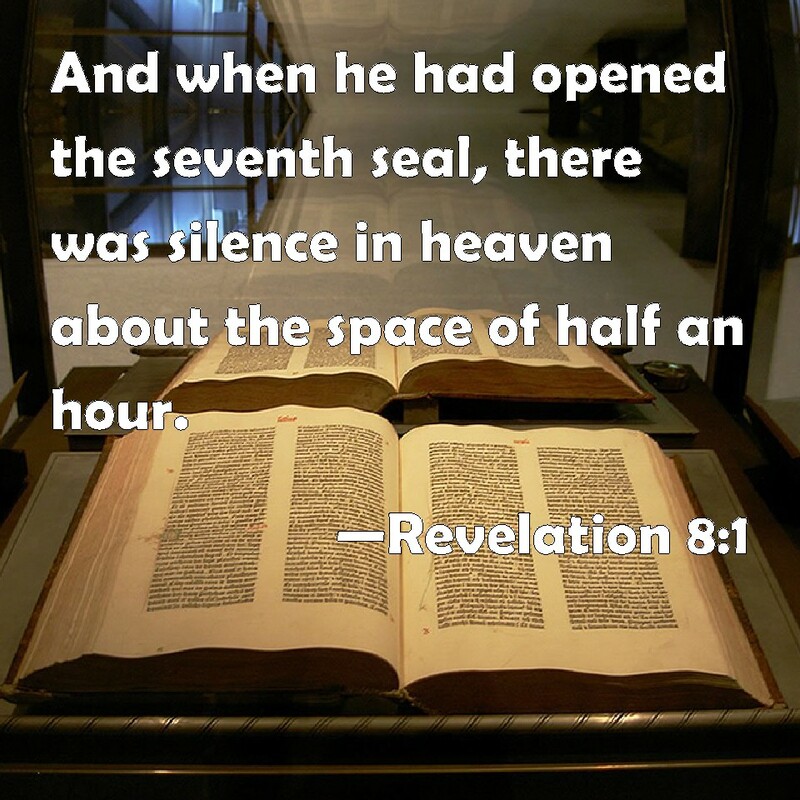 There is a big difference in the teaching of the half hour silence in heaven between Seventh-day Adventists and Davidian Seventh-day Adventists. The standard S.D.A teaching is that it is a description of the Second Advent of Christ. But just as with Swiss cheese, when we look closely at it , it is filled with holes and cannot stand up against the “more sure word of prophecy”. The following study guide , we hope will shed light on the true understanding. Is The Half Hour Of Silence The 2nd Advent Of Christ? a. THE JUDGMENT IS STILL IN PROGRESS since Jesus is still in the Sanctuary opening the seventh seal which means that he is still investigating the names of those during this period. b. CHRIST IS STILL A BLEEDING LAMB. HOUR WHAT EVER WAS GOING ON BEFORE MUST CONTINUE—The Judgment. Therefore the half an hour divides the judgment into two sections— the JOD and the JOL. d. THE PRAYERS OF THE SAINTS ARE OFFERED UP BEFORE GOD. This indicates that probation is still open since you cannot offer prayers after Jesus’ 2nd advent—there will be no need. e. THE ANGEL CAST DOWN FIRE TO THE EARTH. Fire is a symbol of THE HOLY SPIRIT. No one will need the outpouring of the Holy Spirit after the second coming of Christ. f. THE VOICES, THUNDERINGS, LIGHTINGS, RETURN, SHOWING THAT THE JUDGMENT STARTED AGAIN. Compare with Rev. 4:5. The voices must represent the speaking of the beasts, elders, angels, etc. When God speaks it is like thunderings and lightnings. The voices clearly indicate that judgment continues AFTER THE HALF HOUR OF SILENCE. What Happens During The Half Hour Of Silence? The Purification of the Church. a. The silence reveals that the Judgment must have ceased for a time. The only event which would cause silence during the judgment is the purification of the church–Ez. 9. It is the only time we know from both the Bible and the Testimonies that Jesus will interrupt his mediatorial work. “Those who train the mind to seize upon everything which they can use as a peg to hang a doubt upon, and suggest these thoughts to other minds, will always find occasion to doubt. They will question and criticize everything that arises in the unfolding of truth, criticize the work and position of others, criticize every branch of the work in whichthey have not themselves a part. b. This passage must be fulfilled during probationary time because it mentions: “…the unfolding of truth…” Truth only unfolds while probation still lingers. Furthermore, it states that “the Lord Jesus shall rise up FROM HIS MEDIATORIAL WORK…” This would indicate that He will interrupt his work of atonement. How Long Is The Half Hour Of Silence? e. 15/2=1/2 hour =7.5 days (ABOUT a week). Thus the purification of the church—Ezek. 9, will last about a week. SUMMARY: The seventh seal reveals that the JOL in Heaven will begin after the half hour of silence—purification of the church. The half an hour of silence, therefore, divides the investigative judgment into two parts: the Judgment of the Dead (JOD) and the Judgment of the Living (JOL). And He shall sit as a refiner and purifier of silver: and He shall purify the sons of Levi, and purge them as gold and silver, that they may offer unto the LORD an offering in righteousness.Then shall the offering of Judah and Jerusalem be pleasant unto the LORD, as in the days of old, and as in former years. Take a look at the following and see how closely complementing this prophetic Scripture is to Malachi 3:1-5. “For, behold, the LORD will come with fire, and with his chariots like a whirlwind, to render his anger with fury, and his rebuke with flames of fire. For by fire and by his sword will the LORD plead with all flesh: and the slain of the LORD shall be many. They that sanctify themselves, and purify themselves in the gardens behind one tree in the midst, eating swine’s flesh, and the abomination, and the mouse, shall be consumed together, saith the LORD. For I know their works and their thoughts: it shall come, that I will gather all nations and tongues; and they shall come, and see my glory. And I will set a sign among them, and I will send those that escape of them unto the nations, to Tarshish, Pul, and Lud, that draw the bow, to Tubal, and Javan, to the isles afar off, that have not heard My fame, neither have seen My glory; and they shall declare My glory among the Gentiles. Then in the very next chapter the answer is given in Rev. 7:1-8 — the 144,000 ! Thus it cannot be the Lord’s Second coming, rather Mal.3:1-5 and Isaiah 66:15-20. We see some “escape” the Lord’s wrath and go tell the world of the Lord, which cannot happen at the second coming. These purification judgments have never happened yet in the history of God’s people. The second coming will save the “great multitude”(Rev. 7:9) but this “sudden” coming will save the wheat from the tares in the church the 144,000. The half hour silence is that time of His execution of judgment in God’s house. CONCLUSION: The study of the seven seals reveal that God’s professed people have been on trial since 1844. This court case is the greatest and most important in the history of earth and the Universe. Each individual and generation is investigated with terrible exactness. It especially, and more importantly, reveals that the Judgment in the SDA Church will mark the opening of the Judgment for the Living. Thus we see, that soon we will have to stand before the never erring Judge and give an account for our deeds—not physically, but our records will testify to whether we are worthy through the merits of Christ to be sealed, allowing the slaughtering angels to pass by and have our names retained on the Book of Life. Thus, we determine our own destiny by either holding on to our sins or repenting of them and forsaking them. The Signs of Christ’s Second Coming or the Signs of the Kingdom, which? THE SIGNS OF CHRIST’S SECOND COMINGOR THE SIGNS OF THE KINGDOM–WHICH?TEXT OF ADDRESS BY V.T. HOUTEFF,MINISTER OF DAVIDIAN 7TH-DAYADVENTISTS SABBATH, JANUARY 22, 1949MT. CARMEL CHAPELWACO, TEXAS We as students and gospel teachers have for years dwelt heavily on the signs of Christ’s second coming, but not at all on the signs of the Kingdom. As a result of this, Christendom has theoretically merged the signs of the Kingdom with the signs of the second Advent. Something similar to this is what the Jews of old did when they were expecting the Messiah’s first appearing. According to their private understanding they deeply studied the signs of the restoration of the Kingdom, but not so much of the signs of the Messiah’s coming. Thus it was that when they were told that the Messiah had come but not the time to restore the Kingdom, the leaders of the Jews, taking for granted that their private (uninspired) interpretation of the Scriptures was infallible, rejected the message of that day. Then in an attempt to safeguard their influence upon the common people and to subjugate them to their way of thinking, they crucified the Lord, their Saviour and King as they did also kill the prophets who went before Him. Their insistence that the Kingdom be restored in their day, though, profited them nothing. The fact that Christendom itself is divided and confused, one believing one thing and another something else, is in itself sufficient evidence that besides being in total darkness of the signs of the Kingdom because of private interpretation of the Scriptures, Christendom must be in darkness of many other things as well. In such a confused state of faith, Christendom is definitely no more led by the Spirit of Truth than were the rebellious Jews. Past experience teaches, however, that to try to convince the multitude of this fact would be as formidable a task as to convince the Jews even to this day that Christ is the Messiah that was to come. The difficulty, of course, lies in the fact that hardly a theologian allows for the possibility that his understanding of the Bible might be at least in a measure erroneous, and that Inspiration might almost at any moment manifest Itself anew, unroll the scroll and bring forth timely Truth, “meat in due season,” and thus expose their private concoctions of so-called tuth. Now with all respect and sincerity, by the authority of the Scriptures and by virtue of the facts before me, I say that it would be easier for a chicken to find its roost in the blackest of the night than for uninspired mind to unveil the prophecies and the parables. The difference between the two is that the chicken realizes the futility of trying to find her roost after sunset, but the self-willed man does not realize that he cannot unveil Truth at his own will and without light from above. We as Christians have obviously failed to note that if the secret things of God, matter not how simple, were to be unsealed at anytime by anyone, Inspiration would never in the first place have concealed them in symbols and parables. Christendom is still blind to the fact that to attempt to break into the mysteries of God would be to attempt to defeat His purposes; yes, to try to break into the Divine code, is to try the impossible. No one, say the Scriptures, can privately (without Inspiration) unfold the prophecies, for, reasons the Apostle, as prophecy came not by private effort — not by the will of men, but by holy men and the Spirit — neither can it therefore be of private interpretation, but only by holy men led by the Holy Spirit. Moreover, even after prophecy is thus interpreted, only to the righteous (the penitent) is given the gift of understanding it (Dan. 12:10). Since we as a people know some of the signs of Christ’s second coming, and none of the signs of the Kingdom, we had better now concentrate on the signs of the latter. Matt. 13:24-30 — “Another parable put He forth unto them, saying, The kingdom of heaven is likened unto a man which sowed good seed in his field: but while men slept, his enemy came and sowed tares among the wheat, and went his way. But when the blade was sprung up, and brought forth fruit, then appeared the tares also. So the servants of the Householder came and said unto Him, Sir, didst not Thou sow good seed in Thy field? from whence then hath it tares? He said unto them, An enemy hath done this. This parable of the Kingdom, you note, contains three periods of time: First, the period of sowing the seed — the time of Christ’s ministry; second, the period of growing — the time from the ascension of Christ to the harvest; third, the time of harvest — a short period of time “at the end of the world” (Matt. 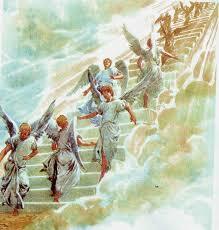 13:49), the period in which the earth is lightened with the glory of the angel (Rev. 18:1), and in which all God’s people are called out of Babylon (Rev. 18:4). Then those who did not respond to this gathering call will cry out: “The harvest is past, the summer is ended, and we are not saved.” Jer. 8:20. The “harvest,” therefore, is “the end of the world.” Matt. 13:49. It commences in the church and ends in Babylon. Mal. 3:1-3, 5 — “Behold, I will send My messenger, and he shall prepare the way before Me: and the Lord, Whom ye seek, shall suddenly come to His temple, even the messenger of the covenant, whom ye delight in: behold, he shall come, saith the Lord of hosts. But who may abide the day of his coming? and who shall stand when he appeareth? for he is like a refiner’s fire, and like fullers’ soap: and he shall sit as a refiner and purifier of silver: and he shall purify the sons of Levi, and purge them as gold and silver, that they may offer unto the Lord an offering in righteousness…. How many yields of fruit is the harvest to give? — If the 144,000 are the “first fruits” (Rev. 14:4), then there must be “second fruits,” for where there is no second there can be no first. The word “firstfruits” absolutely necessitates second fruits. Now, then, if the Judgment begins first in the “house of God,” in the church, then it will end in the world, outside the church circles. The parable of the “net” and the Revelation of John very briefly and concisely bring this truth still better to the surface. Clearly, the net represents the gospel church into which are caught both hypocrite and saint. Accordingly, in the time of the firstfruit harvest (the Judgment “in the house of God”) “at the end of the world” (Matt. 13:49), the angels sever the wicked from among the just, not the just from among the wicked. But in the second fruit harvest (the Judgment in the world) the separation is the reverse: the just are taken out from among the wicked, not the wicked from among the just, so says The Revelation: “And I heard another voice from heaven, saying, Come out of her, My people, that ye be not partakers of her sins, and that ye receive not of her plagues.” Rev. 18:4. Isa. 66:15, 16, 19, 20 — “For, behold, the Lord will come with fire, and with His chariots like a whirlwind, to render His anger with fury, and His rebuke with flames of fire. For by fire and by His sword will the Lord plead with all flesh: and the slain of the Lord shall be many….And I will set a sign among them, and I will send those that escape of them unto the nations, to Tarshish, Pul, and Lud, that draw the bow, to Tubal, and Javan, to the isles afar off, that have not heard My fame, neither have seen My glory; and they shall declare My glory among the Gentiles. Again we here see that those who escape the slaying of the Lord “in the house of God” (obviously the firstfruits, “the servants of God”), are sent to the nations who know not God, and from there they bring all their brethren (the second fruits) to the purified house of God where there is neither sin nor sinner, and where the plagues of Babylon therefore do not fall. We have now positively seen that there are first and second fruits: one from the church — the 144,000 sons of Jacob; and one from all nations — the great multitude which no man can number (Rev. 7:9). Rev. 14:14-19 — “And I looked, and behold a white cloud, and upon the cloud One sat like unto the Son of man, having on His head a golden crown, and in His hand a sharp sickle. And another angel came out of the temple, crying with a loud voice to Him that sat on the cloud, Thrust in Thy sickle, and reap: for the time is come for Thee to reap; for the harvest of the earth is ripe. And He that sat on the cloud thrust in His sickle on the earth; and the earth was reaped. Here we are again told that there are two reapings, one by the Son of Man, and another by an angel. The reaping by the Son of Man precedes the reaping by the angel. “Son of Man,” therefore, gathers the firstfruits, and the angel gathers the second fruits. (The vines, not the fully ripe grapes, he casts in the wine press.) The Son of Man Himself obviously reaps the firstfruits because His servants (figuratively the angel of the church of the Laodiceans) are in no condition to do such a work, for they themselves are “wretched, and miserable, and poor, and blind, and naked,” and know it not (Rev. 3:14-18). For the second reaping, however, He uses His guileless “servants,” the “firstfruits,” the 144,000, as prefigured by the angel with the sharp sickle (Rev. 14:17, 18). And just as there are two fruits and two reapings from two different places, the church and the world, there are, as shown before, also two ways of harvesting: at first the bad are cast from among the good, and at last the good are called out from among the bad. These are some of the signs and events that precede the Kingdom of glory, the second coming of Christ. Then, too, there are other signs, the first of which is seen from the parable of Matthew 25. Matt. 25:1-12 — “Then shall the Kingdom of heaven be likened unto ten virgins, which took their lamps, and went forth to meet the Bridegroom. And five of them were wise, and five were foolish. They that were foolish took their lamps, and took no oil with them: but the wise took oil in their vessels with their lamps. While the Bridegroom tarried, they all slumbered and slept. And at midnight there was a cry made, Behold, the Bridegroom cometh; go ye out to meet Him. Then all those virgins arose, and trimmed their lamps. And the foolish said unto the wise, Give us of your oil; for our lamps are gone out. In this parable it is seen that the church is likened to ten virgins, five of whom do not avail themselves of extra oil — special Truth for this time, that is, these five do not give heed to the truth of the Judgment of the living, the separation or purification of the church. When the cry is made, “Behold, the Bridegroom cometh; go ye out to meet Him,” all ten virgins see that the light of their lamps is going out; they see that the message of the Judgment of the dead is passing. Quickly then, the five wise virgins refill their lamps with the extra oil which they have stored in their vessels, and go on to meet the Bridegroom. But the five foolish virgins, those who thought there was no need for extra oil, no need for an extra message, the message of the Judgment of the living, find themselves in gross darkness. Rev. 3:14-18 — “And unto the angel of the church of the Laodiceans write; These things saith the Amen, the faithful and true Witness, the beginning of the creation of God; I know thy works, that thou art neither cold nor hot: I would thou wert cold or hot. Luke 14:16-24 — “Then said He unto him, A certain man made a great supper, and bade many: and sent His servant at supper time to say to them that were bidden, Come; for all things are now ready. And they all with one consent began to make excuse. The first said unto him, I have bought a piece of ground, and I must needs go and see it: I pray thee have me excused. And another said, I have bought five yoke of oxen, and I go to prove them: I pray thee have me excused. And another said, I have married a wife, and therefore I cannot come. In this parable are seen two periods of time. The first period is while the gospel has “bade many” (Luke 14:16) to the marriage supper, the time from the Apostles to the time of His last servant with the last message God sends to His people, the time all things are “ready.” The next period is the time in which His last servant served (Luke 14:17). This servant is sent, we are told, at “supper time,” at the end of the day, indicating that he bears the last message. Moreover, he is at first sent to those who have previously been “bidden”; that is, to those who were already in the gospel truth, in the church. At the outset he is to contact a class of people deeply engrossed with the cares of this life, and is to tell them that “all things are now ready,” that if they wish they can now prepare and go to the wedding, there to enjoy the Bridegroom’s banquet. This is the last call for the supper. But what happens? — They excuse themselves from having anything to do with the banquet just then. Some lay the blame on their professions, while others blame having to make a living for the family. Whereupon the Master of the house angrily sends His servant to the poor and to the afflicted, to those who are hungry and not too busy to take heed, to those who are not so encumbered with business and home that they cannot answer His call. This very thing takes place in the “city” proper — the church. The poor, those who realize that they are not “rich and increased with goods,” come in, but still there is room for more. Then it is that the Lord of that servant commands that he should go after those who are on the highways and hedges — those outside the church circles, even to the ends of the earth (the “hedges”). But before the servant goes to the highways and hedges on his last mission, the Master emphatically informs him that those who had been bidden and who excused themselves from coming in, are to be entirely excluded from the banquet; that none of them will be permitted even to taste of His supper; that by turning a deaf ear to the call these have closed their own probationary time, and that there is now nothing that can alter the situation. After this the servant’s compelling cry goes out to the nations and the Master’s house is filled, the wedding takes place, and the Bridegroom serves all that are in the house, but none others. This particular prophecy discloses that while the church, Jerusalem and Zion, is asleep and naked with the unclean in her midst, and in captivity among the Gentiles (away from her own land), an awakening cry, a message, comes urging her to arise and put on her beautiful garments, for the wicked, declares the cry, will no more come into her, for they are to be utterly cut off. The signs of the Kingdom, you see, are even more important for one to observe than are the signs of Christ’s coming. If one should miss the signs of the Kingdom, then the knowledge of the signs of Christ’s coming would profit nothing, for all such will be frightened at His appearing and say “to the mountains and rocks. Fall on us, and hide us from the face of Him that sitteth on the throne, and from the wrath of the Lamb; for the great day of His wrath is come; and who shall be able to stand?” Rev. 6:16, 17. Not a blast or a boom, and not a bust either, but the plain, quiet Truth, Brothers, Sisters, is what saves you and brings the Kingdom into being. Ezek. 36:23-28 — “And I will sanctify My great name, which was profaned among the heathen, which ye have profaned in the midst of them; and the heathen shall know that I am the Lord, saith the Lord God, when I shall be sanctified in you before their eyes. For I will take you from among the heathen, and gather you out of all countries, and will bring you into your own land. Then will I sprinkle clean water upon you, and ye shall be clean: from all your filthiness, and from all your idols, will I cleanse you. Here are additional signs, signs which are displayed within and without the man himself: the scars and defects which sin has written upon the bodies of God’s people are washed away; also the sin-hardened heart is carved out of them and a new, tender heart that delights in keeping God’s statutes and judgments, is set in. When does this take place? — After God takes His saints “from among the heathen,” “out of all countries,” and brings them into their “own land,” say the Scriptures. Thus shall they dwell in the land that God anciently gave to their fathers, and thus shall they be His people and He their God. Here you see that no one can meet God face to face and live with Him eternally without first having this body-cleansing and heart-changing experience. Very evidently none who remain ignorant of these signs of the coming Kingdom will have this experience and consequently shall never enter into it, never be fitted to live and reign with Christ. Since these signs are so vital to salvation, they should no longer be overlooked, but should receive first consideration if we expect Christ’s second coming to be for our good, not to our damnation. Indeed, for this obvious reason it is at this late hour this important message is brought to our attention. Zech. 12:5-14; 13:1-5 — “And the governors of Judah shall say in their heart, The inhabitants of Jerusalem shall be my strength in the Lord of hosts their God. In that day will I make the governors of Judah like an hearth of fire among the wood, and like a torch of fire in a sheaf; and they shall devour all the people round about, on the right hand and on the left: and Jerusalem shall be inhabited again in her own place, even in Jerusalem. The Lord also shall save the tents of Judah first, that the glory of the house of David and the glory of the inhabitants of Jerusalem do not magnify themselves against Judah. “In that day shall the Lord defend the inhabitants of Jerusalem; and he that is feeble among them at that day shall be as David; and the house of David shall be as God, as the angel of the Lord before them. And it shall come to pass in that day, that I will seek to destroy all the nations that come against Jerusalem. And I will pour upon the house of David, and upon the inhabitants of Jerusalem, the spirit of grace and of supplications: and they shall look upon Me Whom they have pierced, and they shall mourn for Him, as one mourneth for his only son, and shall be in bitterness for Him, as one that is in bitterness for his firstborn. “In that day shall there be a great mourning in Jerusalem, as the mourning of Hadadrimmon in the valley of Megiddon. And the land shall mourn, every family apart; the family of the house of David apart, and their wives apart; the family of the house of Nathan apart, and their wives apart; the family of the house of Levi apart, and their wives apart; the family of Shimei apart, and their wives apart; all the families that remain, every family apart, and their wives apart…. “In that day there shall be a fountain opened to the house of David and to the inhabitants of Jerusalem for sin and for uncleanness. And it shall come to pass in that day, saith the Lord of hosts, that I will cut off the names of the idols out of the land, and they shall no more be remembered: and also I will cause the prophets and the unclean spirit to pass out of the land. The revival and reformation herein presented — mourning and heart searching caused by appreciativeness of God’s great mercy and goodness — shall be in the day the governors of Judah say, “The inhabitants of Jerusalem shall be my strength,” in the day the Lord makes even the most feeble among them as David, and the house of David as God, as the angel of the Lord. When this thorough reformation takes place then the cleansing fountain shall be opened to the whole house of David. In that day the wicked shall be cut off and kept out of the house of David, and the false teachers, “prophets,” shall feel ashamed of having ever taught their private interpretations of the Scriptures. Then shall men fully realize that though they could be taught by men to keep cattle, yet no man could teach them to prophesy; that this office is restricted to the Spirit of Prophecy, that no prophecy of the Scriptures is of private interpretation. Here we are told that in the latter days, in our time, the ancient Kingdom that was destroyed will be reestablished and exalted above all other Kingdoms. Then people shall “flow into it” because “the law shall go forth of Zion, and the Word of the Lord from Jerusalem.” The gospel work, therefore, is to be finished while its headquarters stand in the Holy Land. Thus the Kingdom is set up in probationary time, in time of salvation and judicial purification, for after it is set up other people from many nations flow into it. This is what the Bible says, and certain it is that this is what is to be, for not even the Devil can defeat God’s plans or cheat His people. Oh, yes, the Devil will try to explain away what these Scriptures say, but he can never make them say something other than what they do say. Besides, anyone taking the Devil’s word in preference to God’s, deserves the Devil’s reward, and I am sure he will not be cheated out of it. Since these signs of the times, in addition to others, are of far greater importance than the “Lisbon earthquake,” “the dark day,” and “the falling stars,” we had better awake to the demand which they impose upon us, and which are bound to fit us for the second coming of Christ and for a home in His Kingdom if heeded. But if these signs cannot awaken us, then it is positive that they will cause us to slide down into the bottomless pit while dreaming of being rich and increased with goods, in need of nothing, supposedly on the way to the glory land. What a disappointment and what weeping and gnashing of teeth that would be! Zech. 1:14-17, 20, 21 — “So the angel that communed with me said unto me, Cry thou, saying, Thus saith the Lord of hosts; I am jealous for Jerusalem and for Zion with a great jealousy. And I am very sore displeased with the heathen that are at ease: for I was but a little displeased, and they helped forward the affliction. Therefore thus saith the Lord; I am returned to Jerusalem with mercies: My house shall be built in it, saith the Lord of hosts, and a line shall be stretched forth upon Jerusalem. Obviously one part of the Gentile nations shall come against the part that is in the Holy Land, and chase them out to make room for God’s people. Then will the Lord’s feet stand on Mount Olives and the Mount shall cleave in the midst thereof and make therein a very great valley. Thus shall the Lord open the way for His people to flee there to the “valley” where the Lord’s feet stand, and all the saints with them (Zech. 14:4, 5). As present truth believers we have known quite thoroughly about the soon to happen prophetic Ezekiel 9 church judgment. Many Elijah message presenters report chapter 9 as they should but leave out the corresponding chapter 10, particularly the first verses. This is truly the “flip side” or “other half” to this great and dreadful work of God. But as we shall see, it shows the glorious result of God’s solemn work and ushers in a “new day” for humanity. Power from on High given. We shall be looking at the first three verses. Before we go into this section, we must note that it is a continuation of chapter 9. The vision continues and the scene develops. This is important to understand as the Lord shows us the results and reason for the solemn chapter 9 events. Let us look at what the Elijah messages says about Ezekiel 10. Following the completion of the “slaughter,” and just preceding the scattering of the “coals of fire” “over the city,” “the cherubims stood on the right side of the house,…and the cloud filled the inner court.” Ezek. 10:2, 3. Later they “lifted up their wings, and mounted up from the earth in my sight,” says the prophet. Ezek. 10:19. You see my brethren, Ezekiel 10 prophesies that the outpouring of the full Spirit of God will take place after the church judgment, not before. That is why false revivals from well-meaning outfits like Amazing Facts, 3 ABN, and a host of others, are running without being sent. They do not truly know the church’s spiritual condition. “Son of man, prophesy against the prophets of Israel that prophesy, and say thou unto them that prophesy out of their own hearts, Hear ye the word of the LORD; Thus saith the Lord GOD; Woe unto the foolish prophets, that follow their own spirit, and have seen nothing! Oh what applicable Scripture is this! Our leading organizations are not preparing the church “to stand in the battle in the day of the LORD.” Neither do they know prophesy correctly. If they would only understand and believe the two very important chapters of Ezekiel 9 and 10, they would know how to help the church “stand” in the day of the LORD’s battle. Instead it is left with the few , mostly laymen, who feel the burden and solemn responsibility to proclaim the Lord’s next coming, the invisible coming into His churches worldwide for the beginning phase of the judgment for the living. This has been the Lord’s modus of operation since the beginning. The downcast, the poor, the fishermen, the lowly and humble, they are the ones who humbly accept His call and go to work. A work that is not popular yet truly needed. “In the last solemn work few great men will be engaged. . . . God will work a work in our day that but few anticipate. He will raise up and exalt among us those who are taught rather by the unction of His Spirit than by the outward training of scientific institutions. These facilities are not to be despised or condemned; they are ordained of God, but they can furnish only the exterior qualifications. God will manifest that He is not dependent on learned, self-important mortals.“–5T 80, 82 (1882). As in the natural state of things, the latter rain comes not only to make the wheat grow but also to bring it to its full maturity, so, by spiritual analogy, this Teacher of Righteousness must bring the saints to the full stature of men in Christ Jesus (Eph. 4:13)–fit them for the Kingdom. But the second phase, that promised power (Joel 2:28) which comes “afterward,” after “the latter rain,” is that for which most Christians are praying without considering that there is a first phase (Joel 2:23)—the “teacher of righteousness,” a final outpouring of Present Truth–which must be obtained before the final outpouring of power can be realized. It is evident that the part which comes “afterward,” the Pentecostal power, comes to enable the receiver to proclaim the latter truth; and this power will not come until the church as a body, “every one grass in the field” (Zech. 10:1), not a group here and a group there, has joyously assimilated for its spiritual growth all the rain that the Teacher of Righteousness, who has now come, has brought. “By fire and by His sword will the Lord plead with all flesh: and the slain of the Lord shall be many….and I will send those that escape of them unto the nations….and they shall declare My glory among the Gentiles….they shall bring all your brethren…to My holy mountain Jerusalem, saith the Lord, as the children of Israel bring an offering in a clean vessel into the house of the Lord.” Isa. 66:16, 19, 20. So in the time between the “latter rain” of truth and the “outpouring” of the Spirit’s power, there will be sealed a consecrated number who will escape from among the “slain of the Lord.” In other words, at the first-fruit harvest, when all the sinners have been taken out of the church and the righteous left by themselves as were the 120 disciples in the upper room, then and only then can the Lord finally pour out His Spirit’s power upon all, so that all (all the “escaped” ones) shall prophesy, dream dreams, and see visions. “And it shall come to pass, that he that is left in Zion, and he that remaineth in Jerusalem shall be called holy, even every one that is written among the living in Jerusalem: When the Lord shall have washed away the filth of the daughters of Zion, and shall have purged the blood of Jerusalem from the midst thereof by the spirit of judgment, and by the spirit of burning. And the Lord will create upon every dwelling place of mount Zion, and upon her assemblies, a cloud and smoke by day, and the shining of a flaming fire by night: for upon all the glory shall be a defense. And there shall be a tabernacle for a shadow in the daytime from the heat, and for a place of refuge, and for a covert from storm and from rain.” Isa. 4:3-6. In closing, Ezekiel 10 gives us a most exciting future promise. Soon the Lord is to pour out His long-awaited Spirit in full upon His servants. The instruction “. .Go in between the wheels, even under the cherub, and fill thine hand with coals of fire from between the cherubims, and scatter them over the city (Ezek. 10:2)” is right upon us. Are we doing all we can to ensure we’ll be one of the recipients? As you recall we ended our last post with John standing in his church with a few others, after witnessing the Lord’s “strange act” and the literal beginning of the “Judgment for the Living”. Among the few were two church leaders, who had fought John’s message. They have survived, but why? Let us now read from the prophet, about what will befall those who have fought the message. “And the kings of the earth, and the great men, and the rich men, and the chief captains, and the mighty men, and every bondman, and every free man, hid themselves in the dens and in the rocks of the mountains. And said to the mountains and rocks, Fall on us, and hide us from the face of Him that sitteth on the throne, and from the wrath of the Lamb: for the great day of His wrath is come; and who shall be able to stand?” Rev. 6:15-17. The sinners in Zion are first to cry to the rocks and to the mountains, then will the proclamation of the great and dreadful day of the Lord go forth far and wide saying: “Hear, ye that are far off, what I have done; and, ye that are near, acknowledge My might.” Isa. 33:13. (1 TG, vol. 5, p.10-12). As we see from the above, there will be some who survive the initial church judgment but oh how it shall cause them to sink to the depths of despair! For they will feel their great mistake so loud and clear within their soul. One can only imagine to see your life before you with no chance to live for ever more. This is truly the most terrible and horrible feeling one could have. But what they did was not right and in fact led to many deaths. The vast amount within the church was denied the message from the Lord, the Elijah message, because these leaders effectively stopped it from gaining any foothold within the church. They professed godliness but were indeed found out as “hypocrites” in that great and dreadful day. Notice it says this running and hiding in the rocks, is in the “fulfillment of the sixth seal.” The Plagues happen during the seventh seal. So the Elijah message clearly points out this time as right after the church judgment, the closing of the sixth seal! That is not to say that there may be a second application for the sinners of the world as well, during the seventh seal. Keep in mind, the light that Ellen White had on this was the application of this reference in the time of the plagues. Her message was not the Elijah message and the scroll advanced as far as was seen by her at that time. Back to John. He had to work underground because his name was smeared to a certain degree, even those who may have had a chance to accept his message, were made prejudiced against John. It all was a truly miserable end result. Now, when we read that they ” hid themselves in the dens and in the rocks of the mountains.” We should keep in mind that our own houses are built of rocks. Plaster, drywall, stucco are all made from rocks and mountains. Therefore, this could indicate that they hide themselves up within their homes, and not necessarily go and drive or run out to the mountains literally. So as the days go by, they must feel like despair beyond belief. The Lord decides to spare, but it’s for His righteous judgement and to recompense their ways for “blood on their hands” because they would not allow His sealing message of present truth to seal the people. Let us look closely at the following word of God. This, I believe, is showing the time of the immediate days following day one of Ezekiel 9. Those who have fought the message are “speechless” as they come to the deep realization that they have fought Christ. They now want to “come in” yet the door must close. The Lord will do something similar in this solemn realization when He raises those who mocked and persecuted Him during His own ministry. They too, see the full realization of their terrible actions. The seven days finally produces the 144,000 from the church. The “elect of God” prepare to go to work, no longer being hitched to the SDA leaders who stopped them from proclaiming His Elijah message. The world is now their stage, the Lord is to now work through them mightily and protect them. Let us recap what we have learned from the 3 posts of the solemn half-hour silence. “For, behold, the LORD will come with fire, and with his chariots like a whirlwind, to render his anger with fury, and his rebuke with flames of fire.For by fire and by his sword will the LORD plead with all flesh: and the slain of the LORD shall be many. They that sanctify themselves, and purify themselves in the gardens behind one tree in the midst, eating swine’s flesh, and the abomination, and the mouse, shall be consumed together, saith the LORD. For I know their works and their thoughts: it shall come, that I will gather all nations and tongues; and they shall come, and see my glory.And I will set a sign among them, and I will send those that escape of them unto the nations, to Tarshish, Pul, and Lud, that draw the bow, to Tubal, and Javan, to the isles afar off, that have not heard my fame, neither have seen my glory; and they shall declare my glory among the Gentiles. 3) There will be “few” that survive the church judgment, yet all have a chance , even right now to embrace His Elijah message and proclaim it. This requires strength and courage , to step forward and admit belief due to the fact that the leaders are fighting it. But those who do, acutely remember that the Lord has always rewarded courage. Noah proclaiming a “strange and fanciful” message of world doom by flood. Moses courageously foregoing his privileged status among the Egyptians on behalf of his poor brethren. Joseph preferring to be thrown in jail rather that to sin by committing an adulterous affair. David taking on the powerful lion to protect his sheep and then later risking his life to go against the mighty warrior Goliath.The Apostles willing to die for Christ rather than submit to the non-believers. The 144,000 likewise must choose to be courageous, even to the point of slander, demotion, false rumors and dis-fellowship, all for Christ’s last message of the “judgment of the living” , aka –the Elijah message. 5) There will be some who survive the judgment, but it will be only for them to see what they have done. Who they have fought and what side they really were on. 6) The end of this seven-day silence shall be the beginning of the Loud Cry. Those who survive, the 144,000, then begin to prepare for their final mission. They know the word says they must head back to Israel, as the war is winding down. The Lord will be waiting there to meet them. 7) The world begins the final battle, which the Spirit of prophecy calls “The Great Controversy.” The sixth seal, and its truth, now passes into the seventh seal and it’s truth. The 3 angels are joined by the fourth angel and the world gets it’s message of truth whereby those who accept it, are sealed and spared the plagues. The message of the fall of Babylon, as given by the second angel, is repeated, with the additional mention of the corruptions which have been entering the churches since 1844. The work of this angel comes in at the right time to join in the last great work of the third angel’s message as it swells to a loud cry. And the people of God are thus prepared to stand in the hour of temptation, which they are soon to meet. I saw a great light resting upon them, and they united to fearlessly proclaim the third angel’s message. We underlined the part that shows another angel (message of truth) comes to join the 3 angels’ messages. This is the “judgment for the living”message, which is to go to the world after it has went to the SDA church. In closing, let us choose to live rather than die in the upcoming church judgment. The Lord is pleading right now to all who will listen. What it takes is courage to stand up and be counted! Those who sit back and say “Yeah I think this message is correct, but I’ll stay quiet about it” may be horribly saddened when they find that they missed their chance to “speak up” and be counted. Remember when Joshua and Caleb came with the much scorned positive report on the promised land? Do we not think that some in the vast crowd, silently admired their courage? Of course there were some, possibly many (over 20 years old). yet did they make it to the promise land? Absolutely not. They clamped up and hid like cowards, afraid to speak up in support for the two courageous souls. God want’s us to “speak”! Brethren, the Lord is giving us a “once in a lifetime” opportunity to be among the 144,000. We need not fear the upcoming “half hour silence”. Rather it will set free all those who have waited on the Lord and believe that He will do as His word says, amen. It’s a regular Sabbath morning, John get’s up and then shortly begins to get ready for the local Sabbath service in his town. After cleaning up, grabbing a bite to eat, he heads out the driveway down to the local SDA church. He arrives about a half hour before service. John has been a member for several years. But he now has a unique relationship with his church. You see, he once was a deacon. A man who was “going places” within his church. He’d advanced fairly rapidly in the circle of the church, being frequently asked to go up before the church on occasions and give a motivational talk based on Scriptures and Ellen White.The local laity had shown much appreciation for the talks, as he was one to “tell it like it is”, in other words–the straight testimony. However his last pre-Sabbath school speech, he was particularly straight, pointing out sins in the church and startling Scriptural revelations of what God was soon to do to purify His church. Unfortunately, there were a couple in the pews who objected to the straight talk. Later he found out that the pastor wanted to speak to him in his office later that week. The meeting went nowhere as far as John was concerned, he had looked deeply into the Elijah message and it all clicked it was harmonious with Scripture and Ellen White. A true majestic message with power and strength to convert the worst of sinners into the Lord’s bountiful and righteous light! John himself has witnessed this power in his own life. He converted completely to the Lord, his Master was now his passion. But it all fell on deaf ears, they would have none of it. They steadfastly spoke of deceptive teachings from the man who brought the Elijah message to the SDA church. John wanted specifics, but none were given. They closed the meeting by making the ultimatum, either John gives up his new beliefs and acknowledges it, or they would have to demote him and remove him from being as deacon. He wrote a resignation letter (upon their request) within the week. But in that letter he warned them that they were making a serious mistake and an unjust one as well. So soon the word spread among the church. Gossip and heresy was spread. John kept going to church faithfully but it would not be the same. A couple months later the head elder called a meeting, which John chose to attend, pointing out to the members that John was a Shepherd’s Rod believer. As if to not only demote him but to smear his name as if he had gone apostate. John defended himself and surprisingly most in attendance were on John’s side that day. Being convicted that the Elijah message, though solemn , was true, he continued to look for opportunities to reach out to members in the hope that someone would study it as well and learn the Lord’s final plans for His church. He’d talk to this one and that one, and they’d give an excuse why they didn’t have the time or they’d get back to him later. He sent out packages to some (Cd’s, DVD’s, literature) and no one would want to study it. They remained relatively silent about the contents after receiving it. In other words, no engagement occurred. He therefore continued to go to church with a heavy heart, for he knew that someday soon each one that rejected this last “pleading message” from the Lord would not escape the church judgment. This Elijah message was THE LORD’S LAST to His church, there would be no other! So this was the church situation as John walked into church that morning. He sat down in his regular area and looked over the church bulletin. He said hello to some of the members as they walked by or came down his aisle. The church, this day, was surprisingly full. As if by some divine power many were drawn to services this day. The service begins on time and starts with the first song. The schedule moves along. John starts to feel eerily strange. Something or someone is tugging on him as if to alert him of something. The service continues, yet John is really feeling something alarming! He knows it is not human. For since his conversion he has remained faithful to the Lord and knows the Lord’s voice. John tries to remain calm but he knows something is up. Now, the time has come for the pastor to get up for his sermon. All are quiet and attentive. Suddenly there is a strong wind within the sanctuary! A howling is heard, as the wind gusts up and down and side to side. People start to look at each other, some get up to walk out of the sanctuary. The door is closed, it has locked itself! The wind and howling continues. What is going on? All are wondering. Some young ones and women start to cry out amid the strange occurrence. The pastor begins to speak, and says, “Please remain calm, please.” He is visably shaking. By now the congregation is very fearful–what is this???!! They are frozen in fear. Suddenly a thunderous Voice speaks, ” Why have you not listened to my servant John — ?” Those within the church who know John, and what he said, now begin to shake tremendously. The others are now even more confused. The Voice continues, “I sent him to you, he had a message from Me, yet you rejected it.” The wind continues to howl, the Voice stops for a few moments to let it sink in, particularly to those who had heard John’s solemn message of church judgment. They start to feel a deep sense of wrong doing from their past actions. But the majority church members have no clue what the Voice is talking about because the leaders had effectively silenced the Lord’s message through John, to a large degree. Suddenly John stands up and cries aloud “Save them my Father if You can!!”. He is weeping and pleading on behalf of his church, his hands stretched out. He now knows this is the great and dreadful day of the Lord! The time has come, the word of the Lord has began to be fulfilled. It is the beginning of the prophesied “half hour silence” –Ezekiel 9! The Voice responds , “My judgment now begins!”. Suddenly, the leaders of the church begin to fall to the ground. There are screams every where within the locked church. The Lord’s angels begin to execute His righteous judgment. John kneels and prays, he cannot look, as the wind continues to howl and blow. There is now a earthquake in the sanctuary, the building shakes. The angels have gone through the church. Suddenly after what seemed eternity, it is now quiet in the church. The wind stops. John feels a calmness over him. He gets up and is startled, there are only a few others standing. But he is perplexed, he sees two of the leaders who fought his message still standing(?) But he quickly realizes why that is, he silently kneels in prayer, for he knows it will turn out horribly for them. The rest is laying dead on the church floor! Ezekiel 9 has come! His prophesied word has been fulfilled. “In that day the Lord will take away the bravery of their tinkling ornaments , and cauls, and round tires like the moon, The chains, and the bracelets, and the mufflers, The bonnets, and the ornaments of the legs, and the headbands, and the tablets, and the earrings, The rings, and nose jewels, The changeable suits of apparel, and the mantles, and the wimples, and the crisping pins, The glasses, and the fine linen, and the hoods, and the vails. The Three Angels Message is about to be proclaimed to the world with God’s power entrusted to His “Jewels.” The fourth angel has now come to join fully with the other angels. John now realizes that he has been counted worthy to go to work in this last great proclamation known as the –Loud Cry. Next week we’ll close by looking at what happens those other six days.And if you can believe it , it’s even worse than the first day! My brethren please seriously consider accepting His final pleading message , it is your future destiny we are talking about! Eternity! Our Lord is pleading to all who are listening, let’s get away from false shepherd’s and listen to His true messengers. If Ezekiel 9 starts in America, let’s say east coast, then won’t the west coast people hear about it several hours prior to services, and then be scared and not go to church that day? As the message of Elijah did indeed start in the USA, possibly the church judgment would start here as well (before going around the world). One scenario would be that the doors on all the churches, starting in the east coast would stay locked by the Lord’s angels, for the necessary hours until the west coast services have been underway. 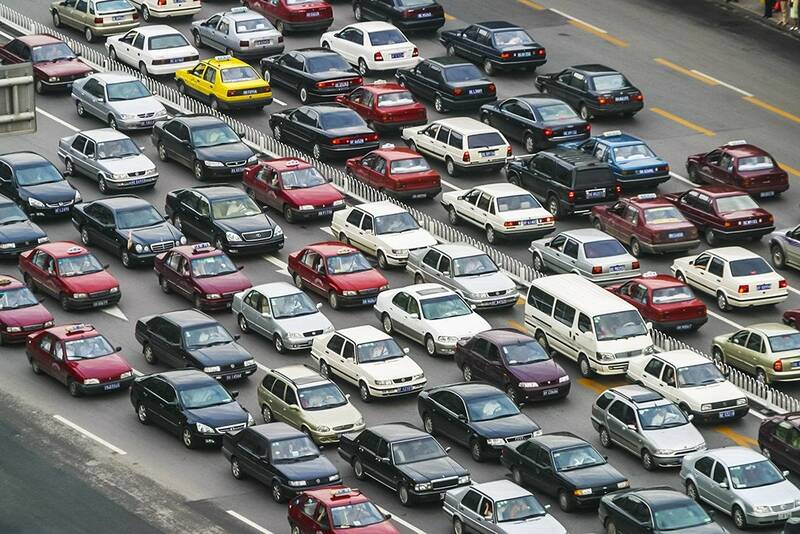 This would stop, at least for the first few hours, the panic that would surely spread once the doors are open. This is just our conjecture and obviously the Lord has His plan. Once Ezekiel 9 is over, what happens to the churches? Do they remain or are abandoned? As the message tells us , there will be few who survive the judgment because of the prevalent pride and rich and increased with goods attitude among the SDA members. The rejection of His Elijah message is THE specific message the Lord had in mind (they would not heed) when He wrote the rebuke of Rev. 3 to the SDA church. So logically the church will be quite silent after the judgment. We know that the surviving “elect” of God will very quickly be on their way to Israel to set up the headquarters for the final proclamation of the –Loud Cry to go around the world. Rev. 14:1 -5 describes the time right after Ezek. 9 where the Lord meets up with His people (the 144,000).on Mt. Zion. As the elect help bring the people out of Babylon, it may well be that the former SDA churches will be a new gathering place for those who come out of the Sunday churches. We are not told in Inspiration much about this unfortunately. We do know that many around the world will come to Israel to join the 144,000. Keep in mind, Israel will then be protected from Satan’s attacks by the Lord Himself, so naturally many will want to relocate there for safety. Will there be any immediate warning that Ezekiel 9 is about to happen, such as a month or week in advance? They are enjoined to fix their vision upon the feet of him who brings “good tidings” (message from the Lord), who publishes “peace” (the peace of Christ’s Kingdom), and who declares that while the powers of earth are engulfed in a gigantic war, the wicked in the church shall be cut off, no more to pass through her. Specifically, the prophet exhorts all penitently to turn unto the house of Judah (the latter-day Kingdom of Judah — Mic. 4; Ezek. 37:16-22), the church in the purification of which are to be sealed 12,000 out of each of the 12 tribes, as firstfruits. Here we see that it is during the upcoming great world war 3 over Israel that this occurs. Some say right after, but this does serve as the great sign that it’s about to happen. The mystical “half hour silence”, what does this really mean? Our standard SDA teachings doesn’t tell us much about this important word of God. But the Lord’s word, through His Elijah prophet certainly does. It is indeed described as an extremely serious and disturbing event to take place within the S.D.A. Church. Please know that the following will happen, yet He loves each and every S.D.A member immensely. When we look at a specific prophecy describing Ezekiel 9 we notice a “pleading” is done before the act. Fire represents the Holy Spirit — “He shall baptize you with the Holy Ghost, and with fire” (Matthew 3:11) — “There appeared unto them cloven tongues like as of fire, and it sat upon each of them. And they were all filled with the Holy Ghost” (Acts 2:3-4). So we add it up and we see that before the Lord slays he pleads with His people with the Holy Spirit and His word. But nevertheless His judgment comes once the pleading is over. It is up to each one of us individually to surrender our pride and fall not asleep with the “peace and safety”message so prevalent in our church today. This subject , we as SDA know, is very rarely discussed within our church, yet it will happen to be one of the most important and earth changing acts in mankind’s history. In graphic demonstration that He will come to earth with all His angels to execute judgment upon the living, the Lord revealed Himself prophetically to Ezekiel as being brought enthroned to earth by four living creatures just before the slaughter of the hypocrites in the church takes place. And as each of the living creatures has the face of a lion, the face of a calf, the face of a man, and the face of an eagle (Ezek. 1:10), — the same judicial insignia as have the beasts who are before the throne in the heavenly sanctuary (Rev. 4:7) in the time of the judgment of the dead, — and as they descend to earth, they thereby symbolically show that the work of the mediatorial-judicial throne which convenes and presides over the judgment of the dead is extended to earth. So we see that this silence is the beginning of the judicial judgment of the “LIVING”, the dead session being completed. In other words it appears that when the judgment begins and extends down to the earth, and when the Lord begins to put His sickle upon the “earth”(Rev. 14:14-16), the SDA church purification begins. This, as we as present truth believers well know is–the Ezekiel 9 church judgment. It produces the “jewels” of God, the 144,000. This half hour silence is solemnly adhered too, by the heavenly beings due to the fact that the “great and dreadful” day of the Lord is taking place. It is also known as the Lord’s “strange act”and His “day of vengeance”. But let us ask the question–Why a “half hour”? What does this mean? First, we have to take the Biblical understanding of time measurement to arrive at what a half hour of time would mean to us in real actual time. In the Bible, a day represents a year in prophecy, according to Ezekiel 4:6, “I have appointed thee each day for a year.” If we apply this prophetic yardstick, one half hour of time would be just about a week or seven literal days. So we see that the actual work of Ezekiel 9 shall compromise about seven literal days in length. As we continue we shall trust that you are already aware of the solemn act of Ezekiel , as described in Scripture..
Let us look at one of the more popular understandings within the SDA (remember the vast amount of SDA do not know about the true Elijah message or it’s interpretations) concerning our subject. They teach that this silence is concerning the Lord coming to the earth in the well-known “Second Coming.” But brother Houteff shows why this cannot be so. The silence in heaven for about half an hour cannot be the second coming of Christ, as some have thought, for afterward the angel with the golden censer and incense, offered the prayers for the saints from the golden altar. The altar is in the holy place, just opposite the throne that is in the most holy. The two apartments were separated by a vail. In the day of atonement, the vail or door of the earthly tabernacle was opened and the high priest went in. But let it be remembered that the door (vail) was left open while the high priest officiated. Thus the two apartments became one. For this reason the congregation were not permitted in the holy place on that day, as they were at other times, for the vail being lifted, the holy place also became most holy. So while the door to the most holy was open, the entrance to the holy was closed. Had the “silence” of “half an hour” pointed to the coming of Christ, at which time He takes his saints with Him, there would be no necessity for the angel to offer their prayers. Furthermore, it would be unnecessary to “cast” fire, which is the Spirit of God, from the golden altar to the earth. Ok so now we have shown that this half hour silence is the Ezekiel 9 church judgment, which is to take about 7 days. But logically we can ask– Why seven days? If Ezekiel 9 is to be the church judgment, why does God extend the solemn act for 7 days instead of more like, one and done? Those are great questions and there appears good answers that we’ll show in part 2. Let us keep in mind that the main purpose of the Elijah message is to prepare us for the “great and dreadful day of the Lord”. So if this subject we are now studying is to truly be thorough we should cover every angle. Did you catch when this surprise visit (Ezekiel 9) happens? During, not after, His mediatorial work in heaven. That is in probationary time, because it is in during the “unfolding of truth” period of time. Ellen White well knew under Inspiration , the upcoming church purification was a real event. Next week we’ll look at the specific ramifications that occur and prophetic references explaining the immediate after effects that take place. We’ll focus on some specifics during the seven days. Remember this one act will truly shake the world and it starts the final event clock that ushers in the Loud Cry. As Scripture says it shall be “great and dreadful”. Is it Past or Future , Literal or Symbolic? 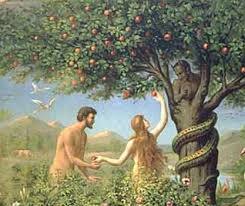 Satan has from the beginning tried to make mankind not believe what God’s word says. The words, “you shall not surely die” (Gen. 3:4) was a direct refute of the clear word of God. God’s word really doesn’t mean what it says. And what has been the historical result? Mankind has bought it hook, line, and sinker. As we have learned from our prior posts, the soon to come “beginning phase” of God’s “judgment for the living” is to take place in God’s remnant church. Our prophetess said, ” Here we see that the church–the Lord’s sanctuary– was the first to feel the stroke of the wrath of God” (Test. for the Church, vol. 5, p.211). She said those words after describing Ezekiel 9. Solemn indeed! Imagine if you will, you are driving late at night with your family down a road. Ahead is a policeman with a big fluorescent sign that says “stop!”, and he’s waving it furiously at you to get your attention. How many of us would continue right on? Most of us would pull over. In this case there was a huge crater (sink hole) ahead in the road. Yet today the vast majority within the SDA church are driving straight past the warnings. Isn’t it time we paid attention to God’s last and final warnings? Recently we received the latest newsletter from Amazing facts. The title is “Satan’s war against God’s word”. It goes on to describe the satanic traps and ways he has worked in america. But what is missing from Amazing Facts and their ministry? It ‘s that warning sign. They ignore the literal judgement to come in God’s house before the plagues. The message of the “Judgement for the living.” Assumption is made that all is well in God’s house until the second advent. There will be no such “first stroke” of God before the coming in the clouds. Spirit of Prophecy said, “study the 9th chapter of Ezekiel, these words will be literally fulfilled ” (Manuscript Releases, vol. 1, p.260). When is the last time your church had a study on this important chapter? Quite the contrary! Instead they are telling people that those who proclaim the Lord’s soon to come judgments are off-shoots, fanatics, etc. Just look at a Tennessee SDA church website. Under “Bible study” they teach people that the “Shepherd’s Rod” teachings are false. Little do they know they brother Houteff soundly refuted all those allegations in the “Answerer” and other writings (Tracts, Timely Greeting sermons and Symbolic code news). We took some time to read their reports and found pure unadulterated confusion and misconception. But the sad thing is, if one is inclined to find hooks and pegs to hang their doubts on, these studies will give you some. 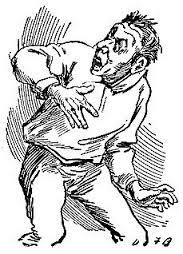 One pastor said that Ezekiel 9 happens “in the plagues” and the other said it happened in the Old Testament days. Which one is correct? Neither. The word of the Lord says, “Thus says the Lord concerning the prophets, who make my people stray; who chant “peace” while they chew with their teeth, but who prepare war against him, who puts nothing into their mouths..” (Micah 3:5). Let us look at some solid inspirational evidence that prove the words of the Lord mean what they proclaim. IS THE SLAUGHTER OF EZEKIEL NINE LITERAL? “The Shepherd’s Rod” teaches that the slaughter of Ezekiel 9 is literal. Could it not be a destruction such as is caused by so-called “acts of God”-earthquakes, famines, pestilences, the seven last plagues, or the like? “The five agents that destroy the wicked in the church are not forces of nature but men with slaughter weapons in their hands. They are supernatural beings, not natural elements. Hence they cannot fittingly represent earthquakes, famines, or the like. Neither can they be the seven angels with the seven last plagues, for these angels are seven in number, not five. Furthermore, they do not have “slaughter weapons” in their hands, but vials. Still further, the plagues fall in Babylon (Rev. 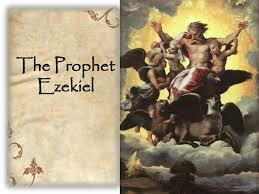 18:4), whereas the slaughter of Ezekiel 9 takes place in Judah and Israel (Ezek. 9:9). Ezekiel 9, whether literal or figurative, effects a separation between the good and the bad, the tares and the wheat, in the church (Judah and Israel), just as the plagues finally do in Babylon (Rev. 18:4). And as the plagues are literal, then how can the slaughter be any less literal? The angel with the writer’s inkhorn is to place a mark upon the foreheads of all who sigh and cry for the abominations, then the destroying angels are to slay both old and young (Ezek. 9 :4-6). “The church—the Lord’s sanctuary,” is “the first to feel the stoke of the wrath of God. The ancient men, those to whom God had given great light, and who had stood as guardians, of the spiritual interests of the people, had betrayed their trust. They had taken the position that we need not look for miracles and the marked manifestations of God’s power as in former days. Times have changed. These words strengthen their unbelief and they say, The Lord will not do good, neither will he do evil. He is too merciful to visit his people in judgment. Thus peace and safety is the cry from men who will never again lift up their voice like a trumpet to show God’s people their transgressions and the house of Jacob their sins. These dumb dogs, that would not bark, are the ones who feel the just vengeance of an offended God. Men, maidens, and little children, all perish together.” —Testimonies, Vol. 5, p. 211. Let’s recap what was said. 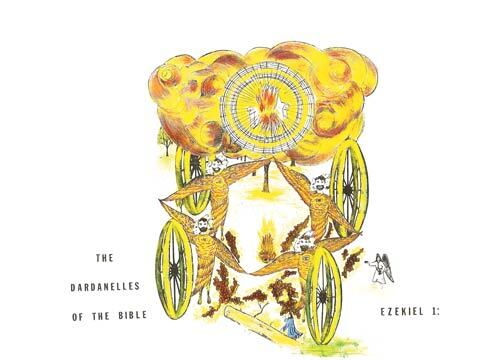 Notice that there is a distinct difference in “5 destroying angels” and “7 angels with vials.” Those who say that the church judgment of Ezekiel 9 happen in the plagues are thus confused. Two different acts and times. Further inspiration says that this act is the “first” stroke of God’s wrath in His “sanctuary”. Obviously the plagues will be strokes of God’s wrath and so this act must precede them, therefore they cannot be “in” the seven last plagues. “Before the close of probation there are two “fruits,” the 144,000 and the great multitude (Revelation 7:9), to be separated at two different times–the former’s taking place before the close of probation while “the door is closed to those who would not enter,” and while “His hand is still stretched out to save.” (“Testimonies for the Church,” Vol. 9, p. 97), thus showing, as does “Testimonies for the Church,” Vol. 3, p. 266, that the sealing of the hundred and forty-four thousand is the closing work for the church, whereas the sealing work for the great multitude is the closing work for the world. Thus, while, in the time of God’s destructive judgments before the close of probation, the door is closed to one class, it is open to another class for whom “His hand is still stretched out to save,” clearly showing that probation closes first for the tares in the church. Moreover, as the time is that of God’s destructive judgments–the separation of the tares from the wheat–the slaughter of Ezekiel Nine is that which severs the wicked from among the just. The satanic game plan hasn’t changed. Once Satan knew a successful tactic of denying or twisting the plain words of inspiration, he’s been using it ever since with great success. Let us not be one of those who fall into his trap. The church is about to be “sprued out” to a great degree because the leaders are neglecting their duty to put up the warning signs. They are preaching peace and safety week after week. We are only “safe” in Christ when we obey His word as brought by His prophets. The last prophet was the Elijah prophet. Going back to that analogy we gave in the beginning, the policeman is representative of those of us willing to “go to work” proclaiming that time is short and that if we don’t stop our wrongful course of paying no heed His final message of Elijah, we will also fall into the ditch (to the dust). Think about this for a moment. If The Lord made the promise to send a last prophet to His people (Mal 4:5 and Test. to Min. p.475), would He being sending it for an unimportant reason? Of course not. As in every instance in Scripture, the Lord had a purpose to reach His people with His message. “The words of Christ apply to the church: “Why stand ye here all the day idle?” Why are you not at work in some capacity in His vineyard? Again and again He has bidden you: “Go ye also into the vineyard; and whatsoever is right, that shall ye receive.” But this gracious call from heaven has been disregarded by the large majority” (Test. for the Church, vol. 5, p.203). Let us not stand idle and watch the other people do what the message tells us we should do. Our church is approaching a gigantic iceberg, are we ready?